Manicare Sonic Mini® Rechargeable Facial Cleansing Brush uses sonic vibration to assist in cleaning impurities from deep within your pores. All it takes is one minute twice daily to help achieve a fresh, clear and even-looking complexion. 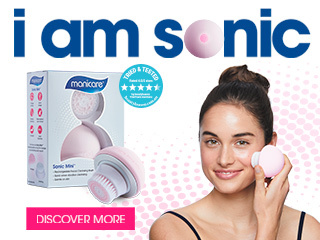 We developed the Manicare Sonic Mini® Facial Cleansing Brush to be compact, light-weight and quiet. It is also water-resistant* and suitable for use in the shower. Includes Sonic Mini® unit, sensitive brush head, brush cover, and USB charging cable. Sonic Mini® brush heads simply click in and out out the main unit. Replacement brush heads sold separately. Charge up to 2 hours before the first use. A full charge can last up to 5 hours of usage. Select desired speed - Press Power button onces for gentle mode, press again for faster-stronger mode, press again to turn the unit off. Apply you favourite cleanser directly to moistened skin or to a damp brush head. Gently move the brush head in small circular motions to clean. We recommend using 1 minute in the morning and night for a thorough clean. To care for your Manicare Sonic Mini®, it is recommended to place device in a ventilated location to dry. Although the Manicare Sonic Mini® is water resistant and can be used in the shower, it is recommended to keep the recharging port dry at all times. 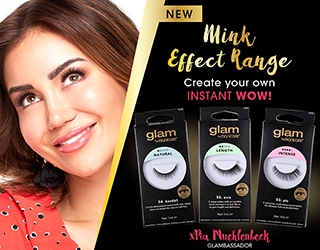 Do not use Manicare® Sonic Mini® to remove eye make-up. Avoid areas around the eyes as the skin is more delicate. Do not use for long periods of time. Recommended full face cleansing time is about 1 minute. If you experience swelling and/or discomfort, etc., please immediately stop using the device and consult a medical professional. ^Results based on a 4 week clinical study with 25 women as part of a skincare regimen using Sonic Mini 2x daily. Independent laboratory study.